Yep, I am familiar with them. I was curious if it was just an aesthetics thing, or was there a problem with accidentally bumping the buttons, as they do stick out a lot, and the cover helps protect them. Guys, I have a suggestion. Can you post pictures of what goes on behind your panels in addition to what is in front? 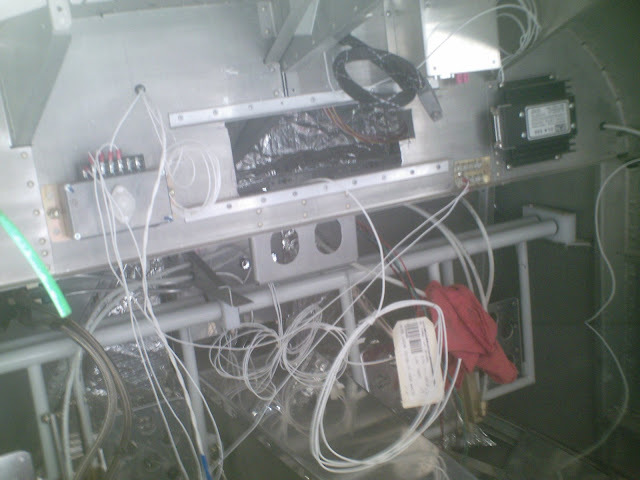 Basically, i have seen hundreds of panels from the front, but unfortunately, i have seen very few of the details of what goes on BEHIND those shiny gleaming whiz-bang panels! How did people make neat wiring runs, or create terminal blocks or not, round terminals or fast-on tabs, or how were service loops handled? etc. I could go on and on with neophyte questions, but I figure a picture is worth a thousand words. It would be great if others could share some of these private parts behind panels (and even from underneath the panels - as if you were to do some maintenance)! Thoughts? Last edited by jchang10 : 08-28-2007 at 09:20 AM. I could go on and on with neophyte questions, but I figure a picture is worth a thousand words. It would be great if others could share some of these private parts behind panels! Thoughts? I wish you would have asked that question a few months ago before we installed our panel. It would have been nice to have some photos of the back in case the were any problems. Last edited by Deems Davis : 08-28-2007 at 11:31 PM. Back of the panel as I am finishing up the wiring. All wire runs head down to the bottom of the panel, over to the next connection, and back up to the device. At least almost all do, some housekeeping still to do. 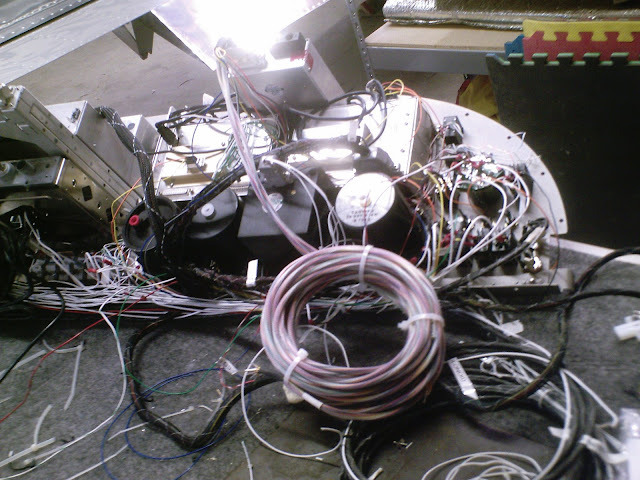 Coils of wires are for runs to the aft---auto pilot, headsets, AHRS etc. And here is the panels soon to be new home----various wiring waiting for the panel to be installed. Boxes on sub panel are XM weather, dimmer, and voltage regulator. Also visible on left lower is the parking brake, which I am going to give more detail in another thread. May I ask what are the componets and what is the cost? Ditto. Scott will chime in, but on the left is a dual Chelton system, about $30k (+ or -, depends on when you ordered). Right is a dual GRT system, about $10k. Center is a (I think) PS8000, G430, SL40, GTX 327 or 330, TruTrak Digiflight II, around $18k. Oh, and the Gx96 on the glarescreen for $2k ;-) All together, that's ~60k. 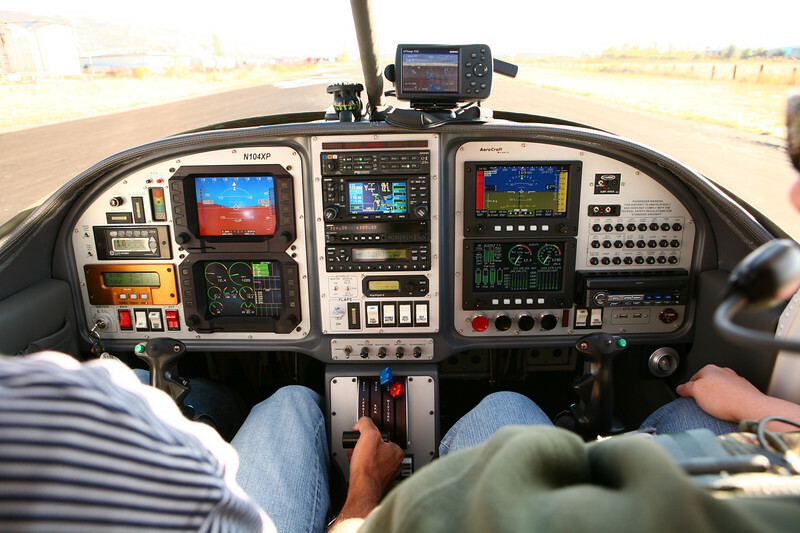 You could get a G1000 install for about $15k more and would have more integration but less redundancy. There's a lot of redundancy there, most importantly different systems, although there are no steam gauges (personal preference). The Chelton has a fully integrated FMS and is legal for IFR GPS approaches if it has the proper GPS sensor. 430 is second NAV and COMM, SL40 is primary COMM (I like that interface better - Scott, which do you use as the primary)? I like the position of the AP, although I'd like to see it even higher on the panel, close to the G430 - kind of depends on how much you use it. Bizjets and heavy iron have the AP controls on the glarescreen because they use them so much. Very nice setup. To save $$, I might go with a SL30 + G496 panel mount instead of the G430 and a single screen Dynon or even steam gauges for backup. I'd love a 3-screen Chelton, but the cost of additional screens is HIGH when compared to GRT and others - about $10k vs $2.5k. Do you know anyone who has the IFR approved GPS sensor (FF 1100) in the Chelton Sport? GNS-430 is the #1 NAV/COMM and SL-30 is the #2. I'm curious also which he uses as primary. For my edification, what is the difference between an FMS and the Flight Plan page of a GPS navigator? Ergonomics suggest that if you look at it a lot, you want it high, however if you use (touch, configure, turn, etc) it a lot, you want it close to your reach, which is low. As George H.W. would say, "that is voodoo economics." An SL30 is about $4K, a 496 about $2.5K, a new 430(w) is about $7K. You save $500 and give up IFR GPS. Doesn't make sense even if you are VFR only. Unless you mean SL-40 (COMM only) and 496. Nope. The SL-30 + G496 gives you XM WX (G430 requires GDL69, $4k, and then the display isn't as good as the 496), battery powered backup NAV, independent CDI on -30 (with OBS setting, which G430 lacks), dual VOR capability. You could also get XM on the Cheltons via (I believe) the heads-up technologies receiver, but that's a few $k as well. You do loose the second IFR GPS and I like knobs of the G430rather than the rockers and buttons of the x96. Operating cost will be less since you are not required to update the database in the 496 every 28 days like you are in the 430. The 430 works fine, but it lacks XM, and the battery backup nature of the 496 appeals to the engineer in me - it's part of the "everything has gone to h***" plan.